Facebook Email Twitter Google+ LinkedIn Pinterest Peterson: From missed shots to the refs — behind the curtain of Iowa State's late-game downfalls With 14 Big 12 games left, there's still time for a lot of positive Iowa State stuff — assuming faulty late-game situations are corrected. Post to Facebook Peterson: From missed shots to the refs — behind the curtain of Iowa State's late-game downfalls With 14 Big 12 games left, there's still time for a lot of positive Iowa State stuff — assuming faulty late-game situations are corrected. Check out this story on desmoinesregister.com: https://www.desmoinesregister.com/story/sports/college/iowa-state/randy-peterson/2019/01/13/iowa-states-cyclones-basketball-late-game-losses-texas-kansas-state-baylor/2534676002/ Cancel Send Sent! A link has been sent to your friend's email address. CONNECT TWEET LINKEDIN COMMENT EMAIL MORE AMES, Ia. — I hung around to watch the Iowa State-Texas women’s basketball game Saturday afternoon at Hilton Coliseum. Not only was it a good chance to see Bill Fennelly’s very good team dang near pull off the upset, but it also was an opportunity to listen to what fans were saying about the men’s game. You know the one — the Kansas State game which the Cyclones lost 58-57 because of a second head-scratching ending in a row. What happened to the Iowa State that had beat Kansas just a week ago? What happened to the team that made 9 of 13 of its second-half three-point shots in that victory against the Jayhawks? Where’d the mojo go? Which team is this, the one that beat Kansas — or the one that lost at home to Kansas State after leading by five points until Dean Wade made a layup with 2 minutes and 10 seconds to go? Losing 73-70 at Baylor is excusable, considering it was away from Ames and at a place where Iowa State has now lost six in a row. It had its head-slapping moments — like when Nick Weiler-Babb missed a 30-foot heave just before the final buzzer on a play that had multiple options. You can’t expect to win on the Big 12 road, but at home? After beating Kansas by 17 points a week earlier, everyone had thoughts of 9-0 at Hilton, of getting a good enough NCAA Tournament seed to possibly play in the Des Moines NCAA Tournament regional, and of possibly even ending Kansas’ 14-year run of the regular-season title ending. I heard grousing about the refs as Bridget Carleton was enjoying a 14-point second half. Why was the out-of-bounds call that preceded Wade’s layup changed from Iowa State’s ball to Kansas State’s? I watched the replay. It was close. There were a lot of hands around the ball. The ref under the basket ruled for the Cyclones with 2:22 remaining and the Cyclones leading by five. The ref on the perimeter, Joe DeRosa (he’s worked multiple NCAA Tournament championship games), overturned the call. And, offensively, where Iowa State missed three shots in the last 1:42, including two in the final 41 seconds? 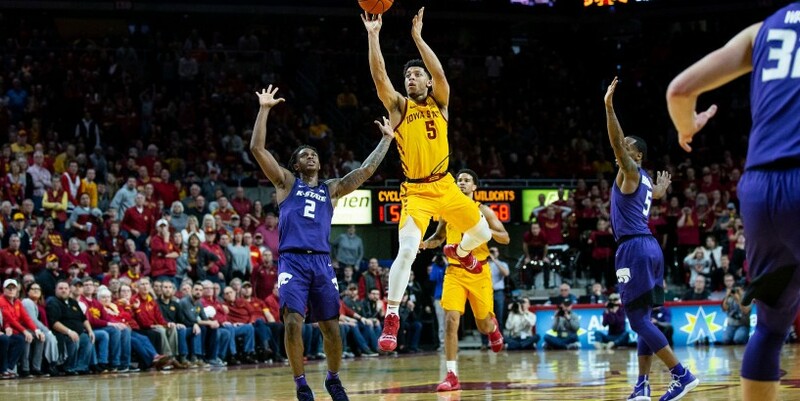 To compound matters, Lindell Wigginton missed the front end of a one-and-one free throw situation with 15 seconds to play and the Cyclones leading by a point. Iowa State’s frustrating finish against Baylor last Tuesday — after leading 66-64 with 3:03 to play — included a disputed held-ball rebound that favored the Bears and the Cyclones missing four of their final five shots. “We can’t let off the gas at the end of the game,” Babb said. The Fix Wigginton still hasn’t returned to his freshman groove after missing 10 games while rehabbing a strained muscle in his foot. In his five games since returning, he’s averaging 11.5 points, and his 33.3 percent shooting includes 6 of 24 from three-point range. Soft-tissue injuries don’t heal quickly. Kansas State star Dean Wade (34 points the last time he played at Hilton) went through the same thing. He returned to the lineup for the first time Saturday after missing six games — and he responded with two points and grabbed nine rebounds in 22 minutes. Facebook Twitter Google+ LinkedIn Iowa State basketball: Kansas State edges Cyclones in Ames Fullscreen Post to Facebook Posted! A link has been posted to your Facebook feed. Maybe when he's got his rhythm back, he doesn't miss the long and off-balance shot he took with a couple seconds remaining Saturday and with Tyrese Haliburton standing by himself on the perimeter. Maybe it happens for Wigginton at eighth-ranked Big 12-leading Texas Tech on Wednesday — and in case you didn’t notice, four of five conference winners Saturday did so on the road. With 14 Big 12 games remaining, there’s still time for a bunch of good stuff to happen.